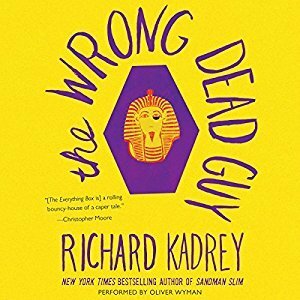 I borrowed an audio copy of The Wrong Dead Guy, by Richard Kadrey, through Hoopla. I chose it because I also happen to have a physical copy of it sitting on my shelf. I figured, if I wasn’t going to get round to reading it anytime soon, I might as well listen to it. Two birds, one stone and all that. I thought this was ok. It was funny (as it was meant to be), but it felt like it went overboard into slapstick, almost stupid-funny. And stupid-funny isn’t really my cup of tea. Also, I didn’t realize was a sequel when I picked the book up. I was able to follow it just fine—it basically stands alone—with the exception of any sort of character introductions. Maybe I’d have been more invested in them if I hadn’t had to figure out things like Jizelle being Coop’s girlfriend on my own. But honestly probably not. They were too busy being pithy to be relatable. All in all, I’d call this a middle of the road read for me. I liked it well enough, but didn’t love it. Oliver Wyman did a fine job with the narration though. This entry was posted in Blogger links and tagged book review, fantasy, funny on September 22, 2018 by Sadie.